Playing in a division that stresses defense-first, the St. Louis Blues are on the cusp of losing the only three defensemen on their roster over the age of 29. Kent Huskins, Carlo Colaiacovo and Assistant Captain Barret Jackman will all become unrestricted free-agents on July 1. While there are bound to be some contract talks with all three of the veterans, it is unlikely that all three will return. Huskins, 33, played in just 25 games in the 2011-12 regular season (missing 46 games due to left ankle surgery). He scored 2 goals and 5 assists and registered a plus-9 in that time. Huskins was signed as a free-agent last July (1-year, $1 million) and was mostly used as the team’s 7th defenseman throughout the end of the season and in the Blues’ playoff run. Colaiacovo, 29, played in 64 games in the regular season, scoring 2 goals and 17 assists while posting a plus-7 rating. Colaiacovo saw a lot of time with Blues’ #1 defenseman Alex Pietrangelo and saw a solid amount of power-play time (2:01 per game; 3rd amongst Blues defensemen). Colaiacovo, along with forward Alex Steen, was acquired by the Blues on November 24, 2008 from the Toronto Maple Leafs in exchange for forward Lee Stempniak. Since his first full season with the Blues in 2009-10, Colaiacovo has seen a steady drop in his offensive production (7G-25A–32P in 2009-10; 2G-17A-19P in 2011-12). Jackman, 31, is currently the longest tenured Blue. He was the Blues’ 1st round selection, 17th overall, in the 1999 NHL Entry Draft. He played in his first NHL game on May 11, 2002 when the Blues lost in Game 5 of the Western Conference Semifinals to the eventual Stanley Cup winners, the Detroit Red Wings. 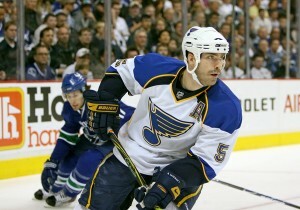 He has since been a staple in the Blues’ roster, being named an official assistant captain in 2005-06. Jackman is not known for his offensive prowess (20 goals in 598 career games), but he did finish the season tied-for-2nd with a plus-20 plus/minus rating. Jackman is currently the Blues’ highest paid defenseman, earning $3.5 million last year. While many fans may be calling for a massive shakeup after the Blues’ disastrous exit at the hands of the Los Angeles Kings in the 2nd round, the truth is that a few minor tweaks may be all that is needed. The Blues posted a league-best 1.89 goals-against-per-game, while also allowing just 26.7 shots-against-per-game, also a league-best. There are some performances that cannot be overlooked, though. Currently, Jackman still has the lowest plus/minus rating in the NHL playoffs (minus-8); this is due in part to posting a minus-6 throughout the Western Conference Semifinals. Jackman, who averaged over 20 minutes per game during the regular season, saw his ice-time diminish to 13:16 in Game 2 and 12:13 in Game 3. Jackman was a key component in Dwight King’s momentum-swinging goal in Game 4 that came just .40 seconds after Chris Stewart scored to tie the game at 1. Jackman was caught up-ice, leaving King open on the right-wing boards. He received a pass from Matt Greene and made the Blues pay. Although this is just a microcosm of Jackman’s play this season, it sits fresh in the collective mind of Blues fans, players and management. The end of the 2011-12 campaign for Colaiacovo was not any better. The Canadian defenseman found himself in the coach’s doghouse for a few blundered plays late in the season, including failures to keep the puck in the zone on the power-play, blown defensive assignments and turning the puck over in the neutral zone. While his plus/minus did not suffer to the lengths that Jackman’s did (plus-2 in 7 playoff games played), his playing time was diminished. Head Coach Ken Hitchcock made the decision to sit Colaiacovo in Game 1 of the playoffs in favor of playing Huskins. Colaiacovo returned to the lineup in Game 2 and played through Game 3 of the series with the Kings. He was a healthy scratch in the Blues’ final game of the playoffs as youngster Ian Cole received his second chance to shine in the post-season. Obviously, being a healthy scratch in a decisive Game 4 does not bode well for Colaiacovo’s future with the Blues. Huskins served his purpose as a 7th defenseman in the playoffs (playing in just Game 1 of the Quarterfinals), but his time with the Blues may already be at an end. With Cole’s progression and the Blues coaching staff likely wanting to get a closer look at Cade Fairchild or Danny Syvret, Huskins may continue his journey across the NHL landscape. The Blues lead a very high-octane defensive system that calls for solid puck-moving defensemen with quick feet. That is what won them 49 games and the 2nd spot in the Western Conference standings. The Blues will likely be looking to build on that system this off-season. Jackman, Colaiacovo and Huskins are more than capable of playing in this system. That is why, I believe, we could see 1-2 of these defensemen back while also giving Ian Cole more responsibilities. Although, it would not be completely out of question to see the Blues dip into the NHL free-agency pool. No no Blues fans, Ryan Suter will not be suiting up in the Scottrade Center 41 times next season. His price tag will skyrocket with an inevitable bidding war. The Blues may have a new owner but will still be under a strict budget. Not to mention that David Perron, T.J. Oshie and Chris Stewart’s contracts will also expire on July 1 (all restricted free-agents). Brad Stuart The Blues have gotten to know this guy pretty well over the years. Stuart, a Detroit Red Wing since 2007-08, averaged 21:03 ice-time last season, ranking 5th amongst Red Wings defensemen. Like Jackman, Stuart is not known for his speed or finesse, but can be a very reliable defenseman in his own zone. 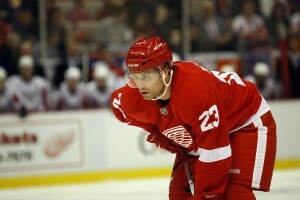 Stuart posted a plus-16 rating last season and led the Red Wings with 177 hits. Stuart is 32 years old and earned $3.75 million annually last season. Bryce Salvador Traded from the Blues to the New Jersey Devils at the 2007-08 NHL Trade Deadline for Cam Janssen, Salvador is still as reliable as they come defensively. Salvador finished the 2011-12 campaign with a plus-18 rating and averaged 20:12 time-on-ice (4th-best on the Devils). He has turned his game up in the 2012 playoffs, scoring 3 goals and 6 assists in 15 games played after posting 0 goals and 9 assists over 82 games in the regular season. Salvador’s age will likely drive his price down (36), but he earned $2.90 million annually last season. If the Blues pursued Salvador, it would likely be for a short-term contract. Greg Zanon If the reigning Stanley Cup winner feels that a defenseman is worthy of playing in their system, he must be doing something right. Zanon, acquired by the Boston Bruins at the 2012 NHL Trade Deadline, has been a steady defenseman since his first full season in 2006-07. Splitting time between the bottom-of-the-barrel Minnesota Wild and the high-flying Bruins this past season, Zanon accumulated a plus-3 rating while also posting a Bruins 2nd-best 136 blocked shots. Zanon, 31, earned $1.93 million annually last season. The Blues’ first priority will be to re-sign the appropriate restricted free-agents. After that process is completed, the defensive core will be getting a strong look.